Vinyl windows are a popular choice for window replacement because of their low price and excellent energy efficiency. Custom Vinyl Products LLC offers a wide selection of energy-efficient vinyl replacement windows by the best brands, plus professional installation. All of the vinyl windows we install are custom-made to fit your window openings perfectly. Call us at 1-866-671-0201 or click below to schedule a free in-home consultation and window replacement cost estimate in Yorktown, Newport News, Poquoson, or nearby Virginia and North Carolina. 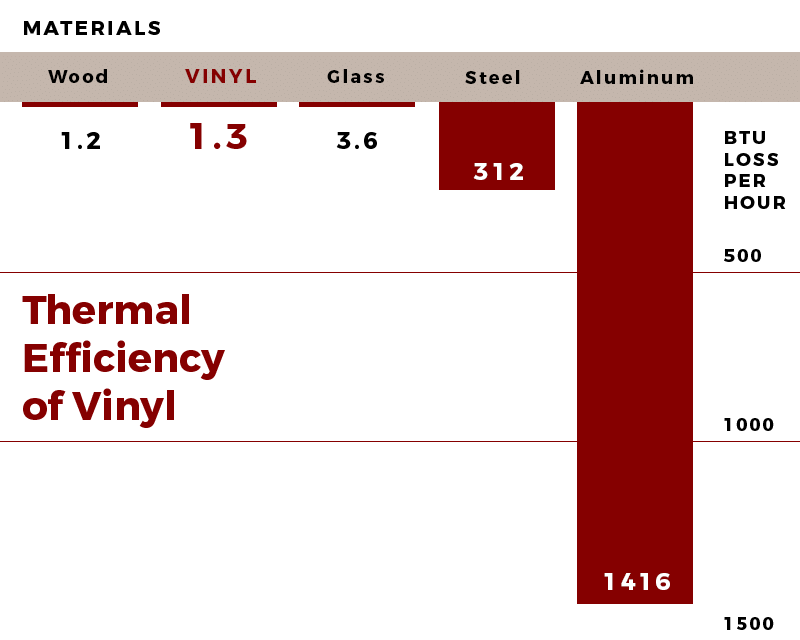 Vinyl windows lose less energy than almost all other window materials. Not all vinyl windows are created equal. There are two different types of vinyl, PVC and uPVC, and the type of vinyl used in the window has a direct effect on the quality of the product. PVC - Typically, vinyl windows are made out of a compound known as polyvinyl chloride, or PVC for short. In general, PVC can be difficult to push through the dies, in order to make the extrusion. To aid the PVC through the dies, plasticizers are added to make the compound more pliable. While plasticizers aid in the production of the extrusion, they can have some adverse side effects as well. Plasticizers can make the vinyl itself very dense and brittle, thus making the final product susceptible to cracking and the effects of ultra-violet light. This is not exactly the type of product most people would want in their home. uPVC - Unplasticized-polyvinyl chloride, or uPVC, is the alternative option and our preference. With this compound, no plasticizers are added. Instead, other additives are mixed with the compound to provide protection from weathering, impact strength, and aid in the processing of the material. The final product is stronger, longer lasting, and will fight the effects of Ultra-Violet light. Custom Vinyl Products LLC is proud to offer several lines of windows using uPVC. Over the years, we have come to enjoy the benefits of offering these products, and we think you will too. Vinyl windows are very energy efficient and do an excellent job of keeping heat in during the winter and out during the summer, thus greatly reducing your heating and cooling costs. ENERGY STAR® qualified triple-pane vinyl windows take this even further by providing maximum energy efficiency and, as a bonus, impressive noise reduction. Do vinyl windows require regular maintenance? Not at all. Vinyl windows are maintenance free. They never need to be painted, scraped, or stained, and are easy to clean. Since they are made from polyvinyl chloride (PVC), vinyl windows won't rust or corrode and are very durable in general. In fact, vinyl windows are durable enough that they generally last about 30 years before requiring a window replacement. Can vinyl windows be customized? Vinyl windows offer a near baffling range of customization and style options. There's a myriad of available size and color options so you're bound to find a style that matches the interior and exterior of your home. Vinyl windows also come in a wide range of styles from bay windows to casement windows, picture windows, and more. Get your free vinyl windows replacement cost estimate! Your expert window installers at Custom Vinyl Products LLC understand the challenge of choosing the best vinyl replacement windows for your home. During your free in-home consultation, we take the time to provide you with personalized recommendations and answer any questions you may have along the way. Call or email us to schedule your free window replacement cost estimate today in Yorktown, Newport News, Poquoson, Seaford, Gloucester, Hampton, Williamsburg, Toano, Virginia Beach, Chesapeake, or nearby Virginia and North Carolina!